A unique pool villa wonderland. Keemala is focused on wellness and quality of life and offers a retreat from every day life in an enchanting evergreen wonderland. Something truly special. Hidden within a canopy of rainforest, each of the 1 and 2 bedroom Villas have been inspired by ancient mythic tribes and the result is a lavish array of exotic accommodation that mimics birds’ nests, tree houses, nomadic tents and Clay pods. There is something alluring and intriguing about a resort that flies in the face of convention. 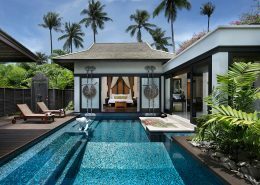 Such a resort is Keemala – a new luxury hillside boutique retreat comprising 38 pool villas of unique and rare design. Hidden within a canopy of rainforest, each of the 1 and 2 bedroom Villas have been inspired by ancient mythic tribes and the result is a lavish array of exotic accommodation that mimics birds’ nests, tree houses, nomadic tents and Clay pods. Under each of the rustic facades however are oversized beds with Egyptian linens, stand alone bathtubs, 21st century amenities, and eclectic pieces that creates a unique sense of style, character and elegance. In keeping with their overriding endeavour for rejuvenation and an enhancement to the quality of life, all of their 4 dining destinations offer a Healthy Living Cuisine version of their standard menu. Their Spa embraces traditional healing approaches and fuses them with the best modern pampering techniques. Happily however, in an effort to maintain true balance, they have an extraordinary wine list and the perfect locations in which to enjoy them. Guests come to Keemala to pause and unwind from the stresses of modern day life. The Holistic Living Programmes feature a variety of personalised activities for guests who wish to Purify, Energise, Unwind, or Rejuvenate. 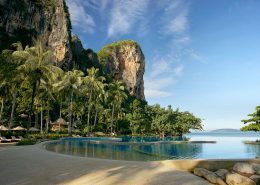 While Keemala is focused on wellness and quality of life, the resort is close enough to Kamala Beach and the liveliness of Patong Beach. I was recently a guest of Keemala, and what a unique and special place it is! 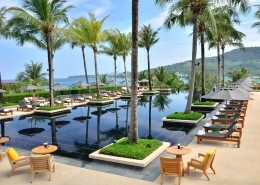 If you’re looking for a Phuket stay that’s not on a beach, this is a resort well worth considering. The design elements alone elevate the resort, though you must know what to expect when booking. As Keemala is built on a hillside, some villas offer less true privacy than others. The villas themselves are quite special. Spacious, well-designed, and boasting some of the most unconventional architecture you’re likely to see in Phuket. The “maxi-bar” in the villas is great — beyond a mini-bar, it offers various snacks, sodas, juices, and local beer, all complimentary and restocked daily. The bed was insanely comfortable, too. Just outstanding in every way. NEW! Escape the ordinary. Get an instant online quote. It takes just 30 seconds to check rates and dates using Island Escapes NEW online booking system. Search your favourite escape AND book online confidently knowing we check EVERY booking to ensure you haven’t forgotten anything. If you get stuck fill in our online quote form OR CALL US! Valid for travel 01 Apr – 31 Oct 2019 (peak season surcharges apply). *Terms & conditions apply: Valid for travel 01 Apr – 31 Oct 2019 (peak season surcharges apply). Prices shown are a guide only, based on low season availability & subject to change. Price per adult, twin share valid for new bookings only. Other conditions may apply.